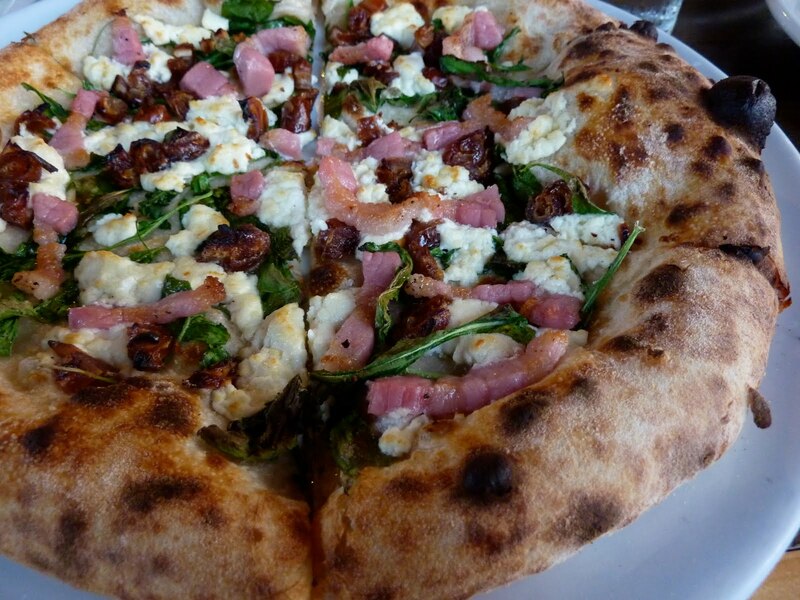 My dear sweet friend Rebecca hipped me to House Pizzeria, a swell restaurant near 51st and Airport. The outside of the building is, shall we say, unassuming, but it’s adorable inside, where they are kicking out some terrific Neapolitan-style pies. 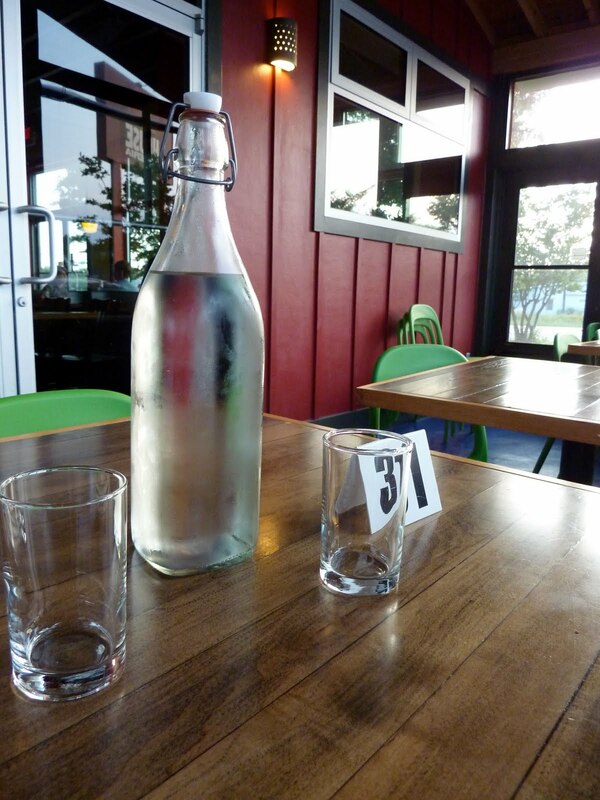 I can say unequivocally that this is my favorite pizza place in Austin. 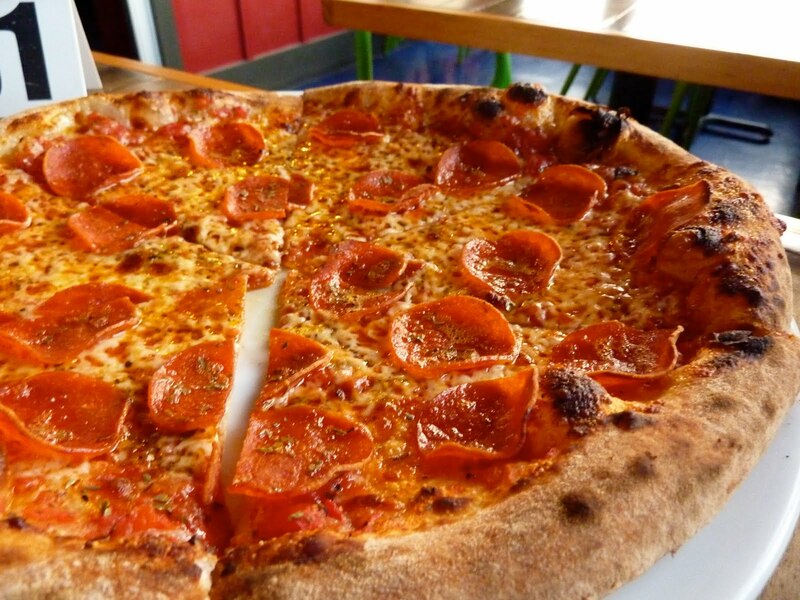 I wouldn’t presume to call it “the best pizza in Austin,” because I know people are fiercely devoted to their own pizza proprietors, whether it be Home Slice, East Side Pies, or ahem, Mr. Gatti’s. Anyway, here’s what we ate! Yes! Yes! I say, to roasted olives. 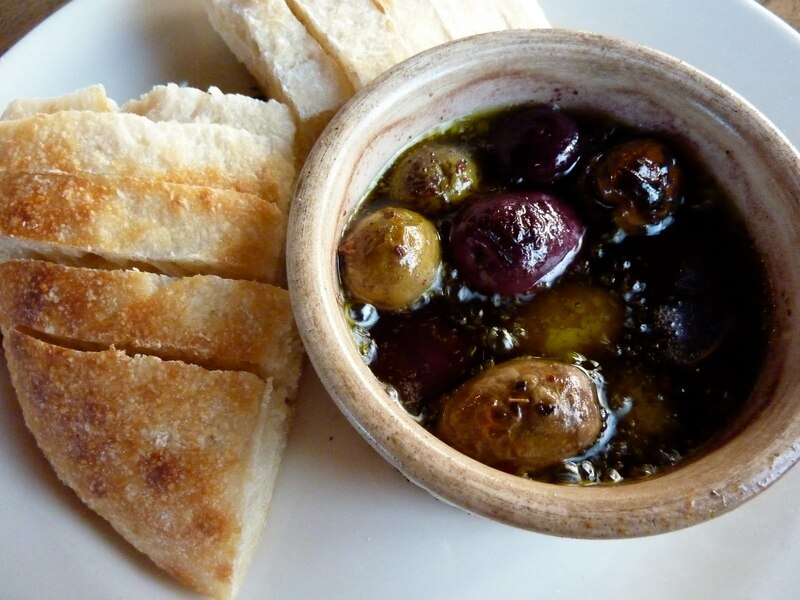 This little ramekin of assorted olives and olive oil is plopped into the pizza oven until the oil is bubbling fiercely, and then they deliver it to your table along with a warm sourdough roll. I loved it a healthy amount. This is Helen’s mixed green salad. Yes, it is enormous. 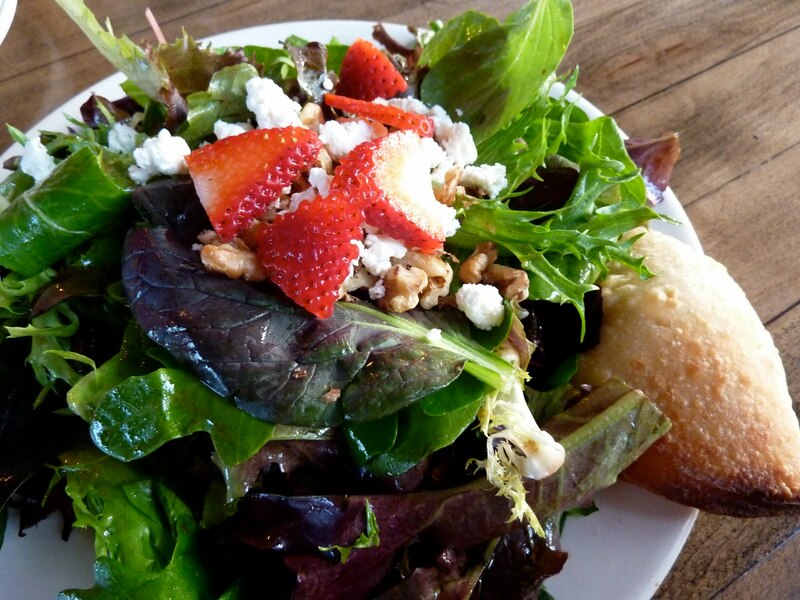 Sister-of-my-life thought it was tasty, but what wouldn’t be with strawberries/goat cheese/walnuts on top? I guess a few things… I didn’t try this, because I had already eaten an impressive amount of olives and bread, and still had a whole pizza to eat. On to the star attractions! Helen’s pizza! She got the Potato and Goat Cheese. This was mighty tasty- they par-roast the potatoes so they’re crisp on the outside and creamy on the inside. 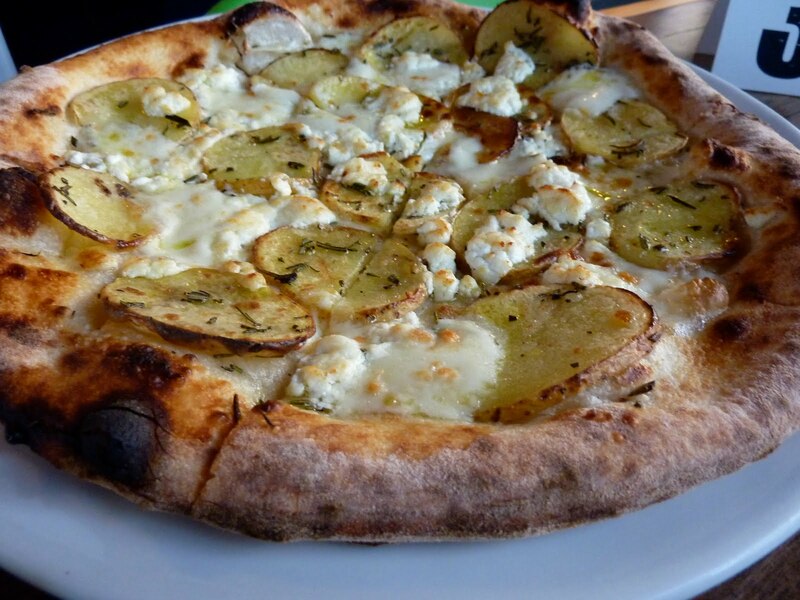 So many places don’t handle potato pizzas well, but they did a swell job. I think they might have been a bit heavy-handed with the rosemary, though. (And I love rosemary! So much so that I plucked several needles from the garnish sprig that accompanied the roasted olives to eat along with the bread (until one needle got lodged in my throat-I am very graceful and sophisticated, if you didn’t know)). “Poor predictable Bart, always picks rock.” “Good ole rock! Nothin’ beats that!” Andy always, always orders pepperoni pizza. House’s version is a real winner, though. I mean, look at it! Not too cheesy, not too saucy. Andy decreed it to be his favorite version in Austin! It looks SO delicious! Beautiful pictures and great review I look forward to going back soon! Enjoyed the Simpsons reference. 🙂 And thanks for the restaurant tip! Looks awesome. Everything looks really delicious but I'm with Andy I'll stick with the peperoni or maybe they have a veggie that I could try. I love the way you write. This looks great. Thanks for the tip.